"People don't know that you're a veteran too"
There are 1.5 female military veterans in the United States, but, like former Army Sgt. Sarah LeMire, many become indistinguishable from average citizens after their service is over. LeMire served from 2002 to 2007 and was deployed in Iraq from 2005 to 2006. 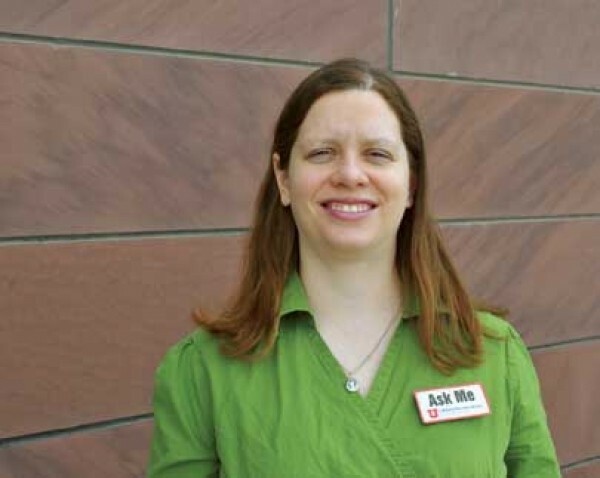 She now works as a research and information librarian for the Marriott Library at the University of Utah. LeMire organized a panel discussion on military women and their unique experiences (Thursday, Feb. 28, 5:30 p.m., Marriott Library Gould Auditorium). University-affiliated women veterans will share their experiences, and Lioness, a documentary about female engagement teams in Iraq, will be shown. The event is free and open to the community. I’ve been working with the Veterans Support Center, which is the organization for student veterans on campus. We started talking about how frustrating it is to be a woman veteran, how people don’t know that you’re a veteran too. We started talking about all these women veterans we’d met on campus, and the idea of getting them together for a panel discussion, and have them share their stories for the community. There is a documentary that I’d come across [Lioness] on female engagement teams in Iraq, women who are attached to combat units while deployed, and their experiences. It was really interesting, and I thought we’d bring that in to further the discussion of what women’s roles are in the military, and the experiences women are having nowadays. The panel turned out to be surprisingly diverse. We’ve got volunteers from all branches of service, except the Coast Guard. We’ve got Army, Navy, Air Force and Marines, enlisted and officers, people who served recently, people who retired after long service. They have really diverse experiences. Not everyone was kicking in doors in Afghanistan or Iraq. How are female veterans’ experiences different than male veterans’? There’s still a really large assumption that veterans are men. It’s almost like you have to prove that you’re a veteran. A lot of guys still have the short haircuts, and they have the build. And women don’t. It’s hard to find the other women. They’re hard to spot—you don’t have the short haircut. Once you take your hair out of the bun, you look like a civilian. And you do want to talk to other women about their experiences. When you get any veterans together, they start talking shop, and it’s a slightly different shop talk with other women. My husband is still serving, in the National Guard, and when we would go to a veterans event, they would assume that my husband was the veteran and I was the spouse. Not to denigrate the role of the spouse, it’s a hard job—I know that—but I served, too. Why was your experience in the military like? I’d majored in Russian in college, and I thought that joining the military might be a way to further explore languages. I wanted to do Russian, and they told me that they didn’t have a big need for Russian linguists at the time, so they offered me a choice of Arabic or Korean, and I chose Arabic. Iraq was probably the most vivid of my experiences. Everything up to that point was building to deployment. We invaded Iraq while I was in Arabic class. I was an Arabic translator. I met a lot of different people, it was really eye-opening for me, meeting people from all over the country and all over the world and working closely with them. Going to a country that was at that point on the brink of civil war, and seeing how that affects life for people, and especially for civilians—women, children. Their lives were so disrupted by that experience. What do you think of women now being allowed to serve in combat roles? To me, it’s kind of removing what was a blurry line anyway of being attached to a combat unit versus being assigned to one. I think it will probably be less earth-shattering than some people are expecting it to be. It’s already so close to being reality at that moment. By the time I went over there, any time they would have to go out and interact with the community, they would send women to work with the women. I would hope that it would improve things by opening up the opportunity for women to have training. When you are attached to a combat unit, you have a better idea of what’s going on. You’re more integrated, and you have a better chance of building relationships and understanding what’s going on. In a combat situation, so much of it is instinctive, and body language. In the military, they use the term “muscle memory”—you just practice until it becomes instinctive. When you’re not part of that, it can be a bit of a hazard. It seems likely that in the future they will continue to need women to be involved when they go out into the community because there are women everywhere, and there are a lot of cultures where it is not acceptable to have foreign men or men not of that family talking to women or directing the women or frisking the women. So, having women to ease that cultural barrier is going to be important for a long time. Is it difficult to be a veteran in a nonmilitary culture? When I deployed, my husband moved back to Utah. I deployed out of Texas, and he moved back here and kind of reintegrated with his National Guard buddies, and found support in that structure, but being around people who know what it’s like. It can be really hard when you’re the only person around you who is going through it. When my husband deployed, I was here in Salt Lake, and it really felt like the world was going on around us. He deployed to Afghanistan, and it was not affecting people’s lives the way it does when you deploy out of a major military base where half the population has left—everyone around you is going through the same thing and is really intimately aware of the war. In a civilian population, people try to be supportive; it’s just hard when you haven’t been through it. It certainly hasn’t been a very typical experience in the wars in Afghanistan and Iraq in that the civilian world is largely untouched by it. If you look back at World War II, people are buying bonds and rationing and really having their day-to-day lives impacted, whether or not they had a loved one serving. It’s just not quite the same right now. It does lead to some isolation. Does anything ease the transition back into civilian life? Having support when you get back and people who aren’t judgmental and don’t immediately assume that you’re unstable and can just understand that it’s hard to cope. Time helps. A lot of times, people have met somebody who is a veteran, and how [that veteran] handled it is how they expect other people to handle it. And everybody’s different. Everybody has different experiences. It’s hard to close the book entirely and move on from it. It’s hard, it takes a toll. The library has been wonderful about encouraging me to reach out to veterans on campus and look at them as a special population and if there are ways that we can help them succeed. Veterans tend to have high attrition rates. They have families and lives and bills to pay, and it’s hard to go back to school and look around and everyone is 18.